Nitin Nohria became the tenth dean of Harvard Business School on 1 July 2010.He previously served as co-chair of the Leadership Initiative, Senior Associate Dean of Faculty Development, and Head of the Organizational Behavior unit. His intellectual interests center on human motivation, leadership, corporate transformation and accountability, and sustainable economic and human performance. He and Amanda Pepper collaborated with XPlane in creating the Paths to Power video to generate a discussion of the value and importance of leadership in addressing some of society's most pressing problems. In June 2010, in anticipation of a conference he hosted with Rakesh Khurana and Scott Snook, Harvard Business Review launched a six-week blog on how leadership might look in the future. He is co-author or co-editor of 16 books. His most recent, Handbook of Leadership Theory and Practice, is a compendium dedicated to advancing research on leadership based on a colloquium he organized during HBS's centennial celebrations. In Paths to Power: How Insiders and Outsiders Shaped American Business Leadership, he chronicles how leaders from different backgrounds-some who could be considered insiders and others who were outsiders-rose to power in American business. This is a companion book to In Their Time: The Greatest Business Leaders of the 20th Century, which draws lessons from some of the most celebrated American business leaders of the 20th century. The third book in this trilogy of historical studies of leadership is Entrepreneurs, Managers, and Leaders: Leadership Lessons from the Airline Industry. What Really Works: The 4+2 Formula for Sustained Business Success, a systematic large-scale study of management practices that truly differentiate business winners. Changing Fortunes: Remaking the Industrial Corporation examines the decline of industrial firms in the last quarter of the 20th century and discusses what can be learned from this experience. Driven: How Human Nature Shapes our Choices explores four basic drives that shape human motivation and choice. Master Passions: Emotion, Narrative, and the Development of Culture discusses how the passions shape not only our individual lives but our social and organizational culture as well. The Arc of Ambition: Defining the Leadership Journey examines the role of ambition in the making of great achievers. Breaking the Code of Change is an edited volume of different philosophies and perspectives on organizational change. The Portable MBA Desk Reference is a resource-book of essential terms, concepts, and references for business students. The Differentiated Network: Organizing Multinational Corporations for Value Creation won the 1998 George R. Terry Award, granted annually by the Academy of Management to the book judged to have made the most outstanding contribution to the advancement of management knowledge. Fast Forward presents the best ideas on managing business change. Beyond the Hype: Rediscovering the Essence of Management looks beyond the quick-fix panaceas being thrown at managers. Building the Information Age Organization examines the role of information technology in transforming organizations. Networks and Organizations: Structure, Form, and Action, an edited volume of original articles, explores the emergence of network-like organizations. Dean Nohria is also the author of over 50 journal articles, book chapters, cases, working papers, and notes. He has served as an advisor and consultant to several large and small companies in different parts of the world. He has been interviewed by ABC, CNN, and NPR, and cited in Business Week, Economist, Financial Times, Fortune, New York Times, and The Wall Street Journal. Dean Nohria has taught courses across Harvard Business School's MBA, Ph.D., and Executive Education programs. He also served as a visiting faculty member at the London Business School in 1996. 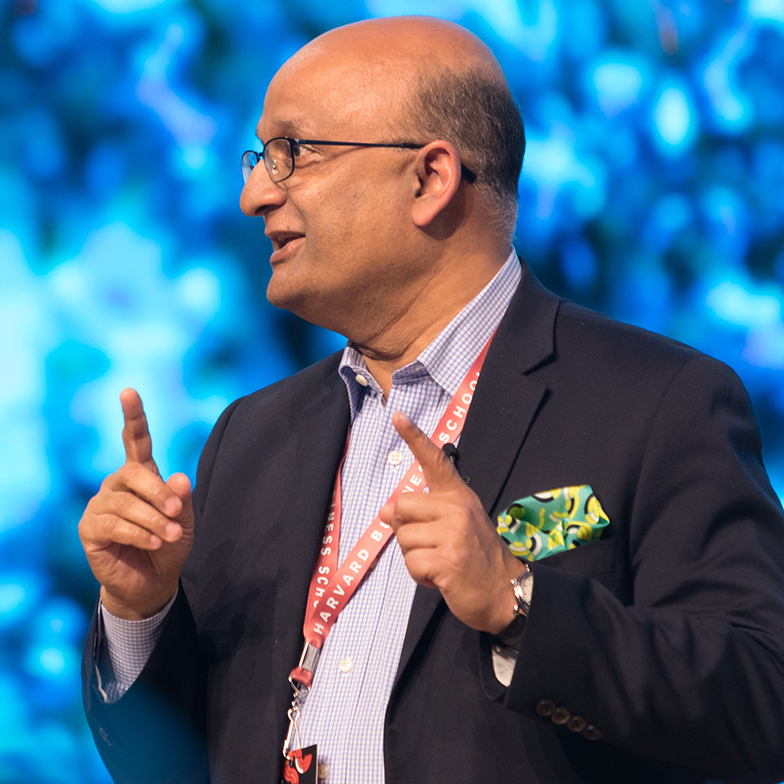 Prior to joining the Harvard Business School faculty in July 1988, Dean Nohria received his Ph.D. in Management from the Sloan School of Management, Massachusetts Institute of Technology, and a B. Tech. in Chemical Engineering from the Indian Institute of Technology, Bombay (which honored him as a Distinguished Alumnus in 2007). He and his wife live in the Boston area with their two daughters. Harvard Business School strives to be a model of the management principles it teaches; learn more about faculty and staff members who, working in a unique partnership, lead the School's programs and operations. Dean Nohria is the tenth Dean of Harvard Business School. He succeeded Jay O. Light in 2010. A full listing of previous deans is available in our history.